I can’t believe it is almost February. Wasn’t it just Christmas???? 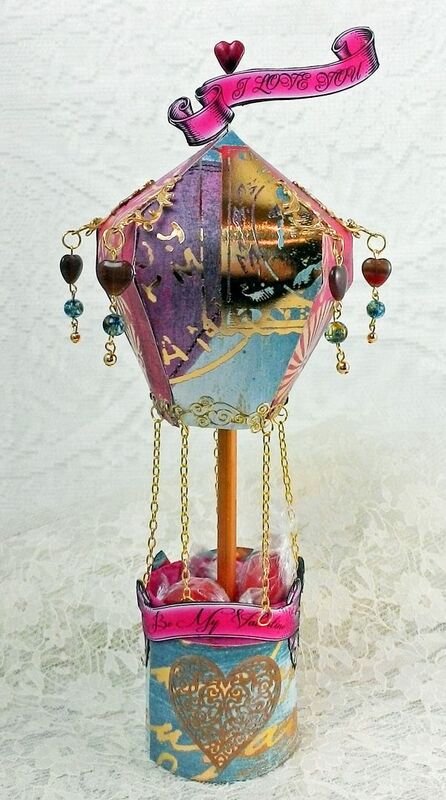 Anyhow, every year I make a valentine for my husband; and this year its a hot air balloon with its basket full of candy. Last summer I posted a tutorial on how to make a hot air balloon. If you missed it there is a video and templates that you can download. Click here to jump to the tutorial. The basic difference between this balloon and the ones in the tutorial is that instead a hanging balloon it is made to sit on a flat surface. The balloon is held up with a wooden dowel. The basket is a piece of cardboard tubing from wrapping paper. The chains hanging from the balloon are not connected to the basket. I wanted to give the appearance that they were but if I actually connected them then it would be hard to get the candy in and out. 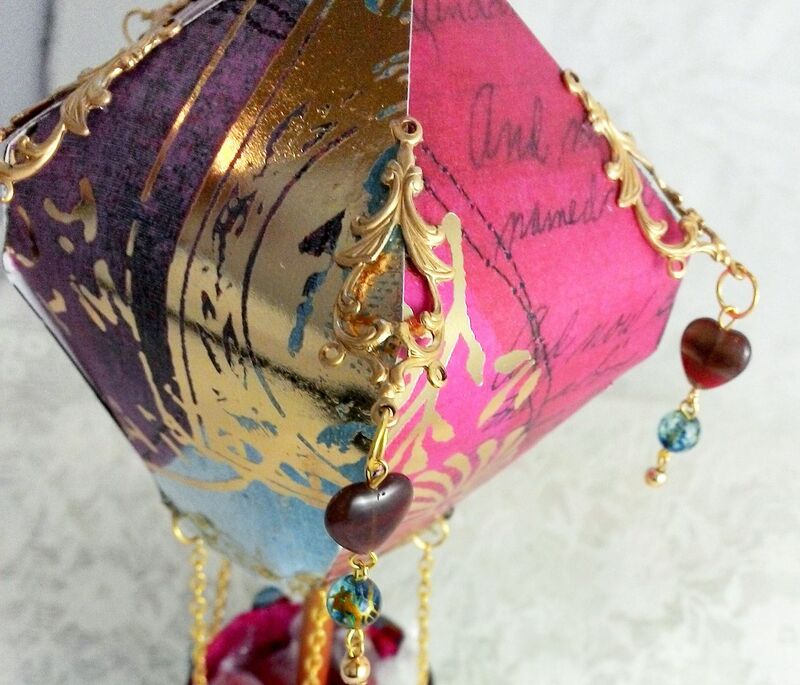 To jazz up the balloon I used some filigree pieces (which I bent to fit the shape of the edges) to accommodate beads. The banner at the top is attached to a straight pin with a heart (it came that way). I snipped part of the pin off and inserted it through the top of the balloon and into the wooden dowel. I pre-poked a hole in the top of the dowel to accommodate the pin. It would be easy to scale this up to include lots more candy or other goodies. All of the supplies I used are from my stash. Below are the two banners I cooked up for the project. Feel free to use them. 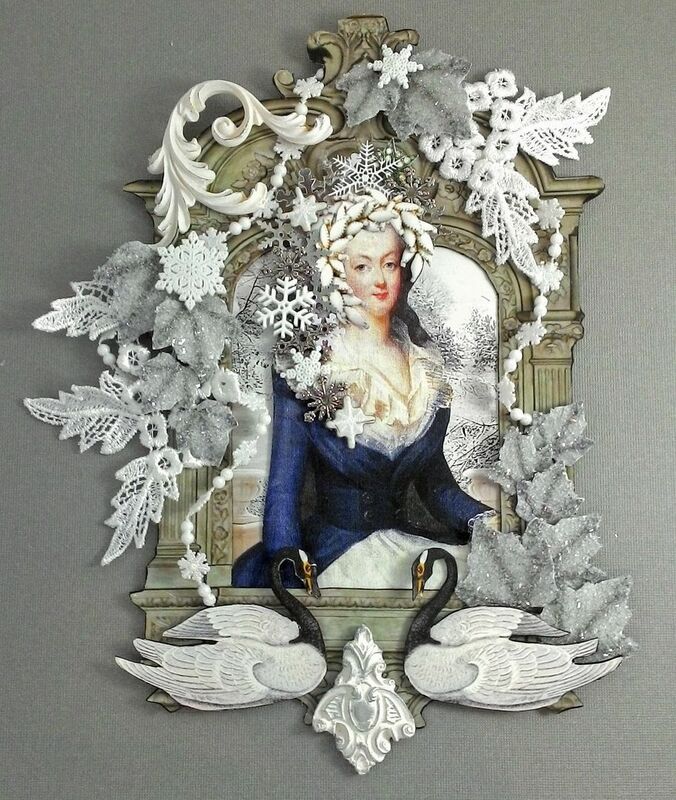 For all you Marie Antoinette fans I have “Snow Queen Marie” with her crown of snowflakes. The overall size of the piece is 9” x 6”. 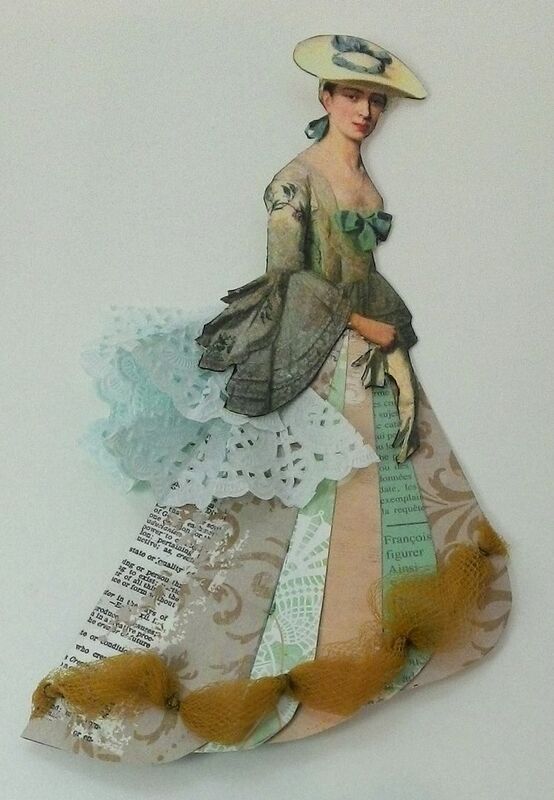 The piece at the bottom is made from paper clay. The icy leaves are images to which I added Diamond dust. Behind the leaves is lace. The swirl on the top left is resin. This finishes off my cold wintry projects so now own to warmer themes! 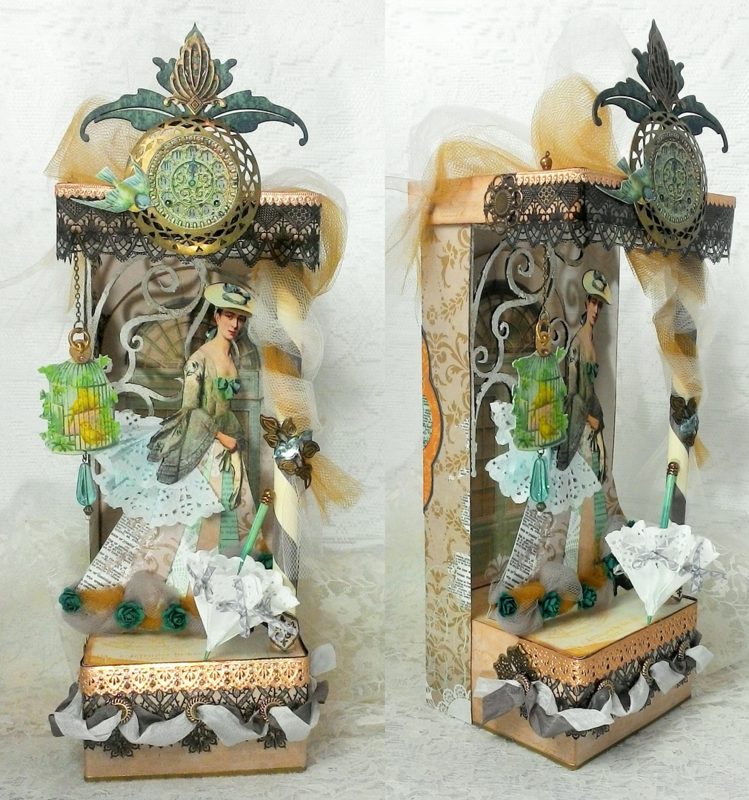 This diorama showcases a lovely Victorian lady leaving her home perhaps to meet a friend in the park. You can see that she is standing outside a door pulling on her gloves. Her lovely parasol (made from a doily) is leaning against the column waiting for her to pick it up. 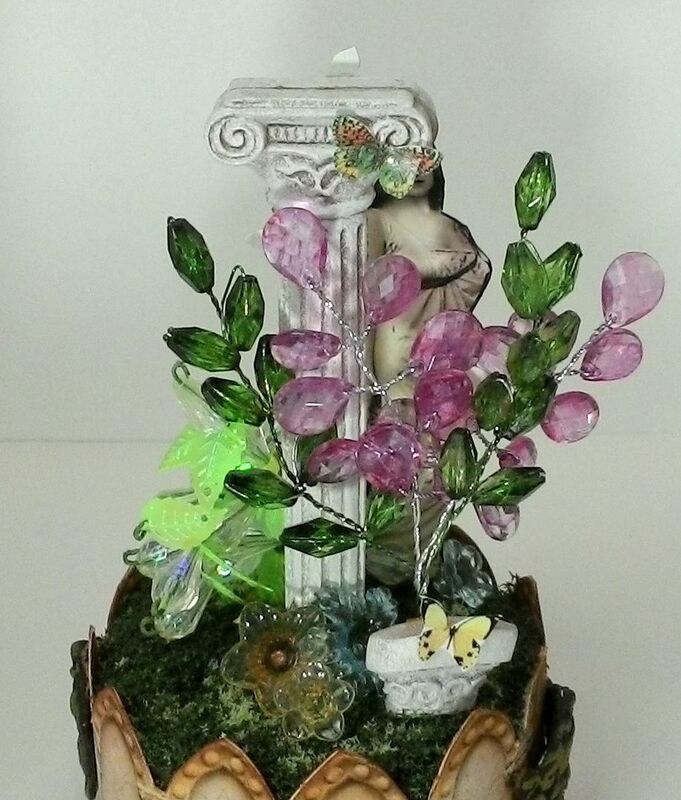 The overall size of this piece is approximately 13 ½” x 4 ½” which includes all of the embellishments. You all know I love creating dioramas and of course I’m always looking for different methods and materials to use. If you love them too but have been thinking that they are too complicated to construct, I hope this project changes your mind. 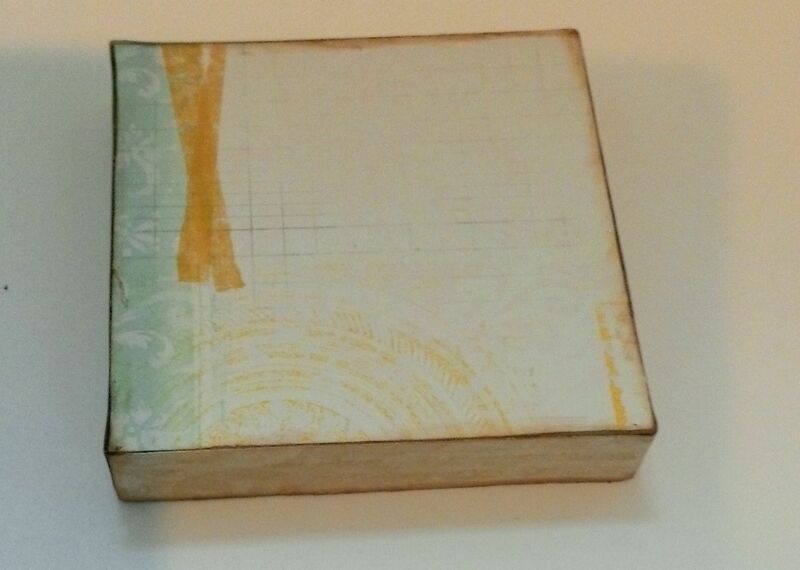 The base of this piece is nothing more than a box and some paper. Yep, that is all it is. The rest is just glue and embellishments. 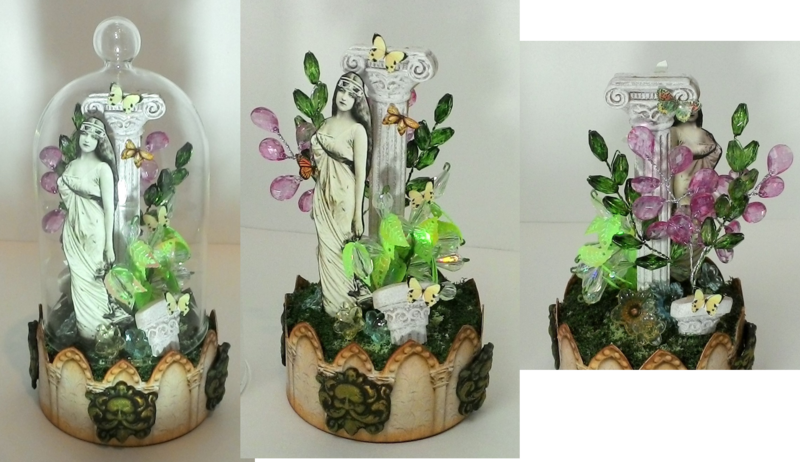 In the tutorial below I walk you through how easy it is to create a diorama using a paper mache box and decorative paper. 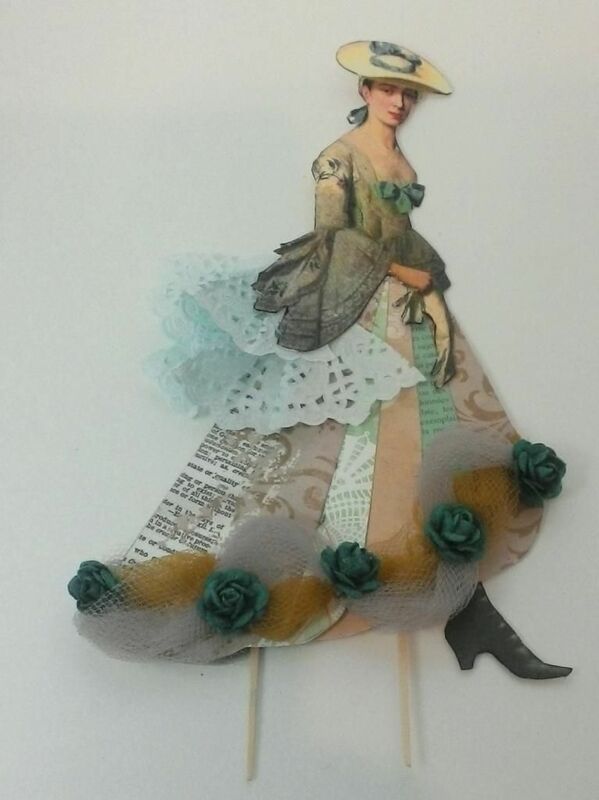 I’ll also go over all of the embellishments I used and how I created the Victorian woman’s skirt and doily parasol. 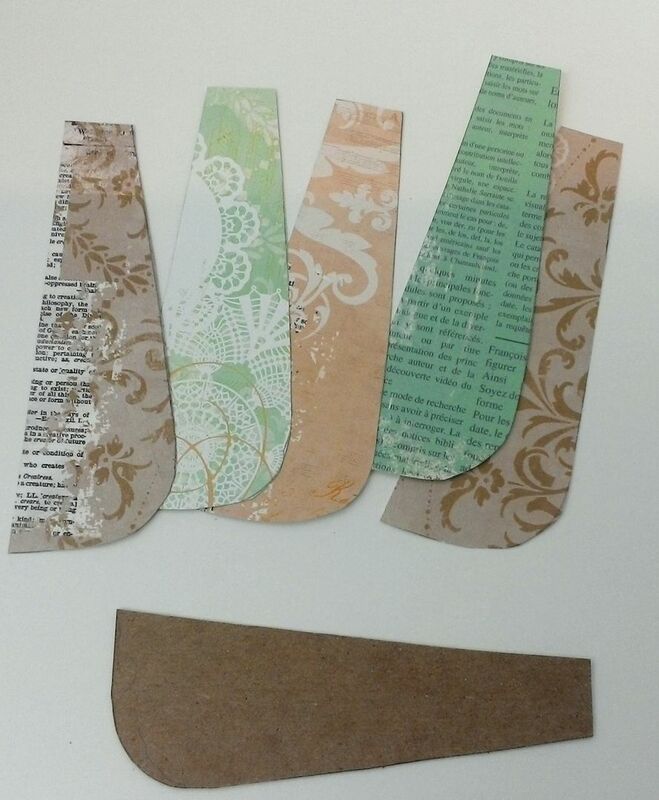 Next, I cut out pieces of decorative paper to serve as the supporting back and sides. 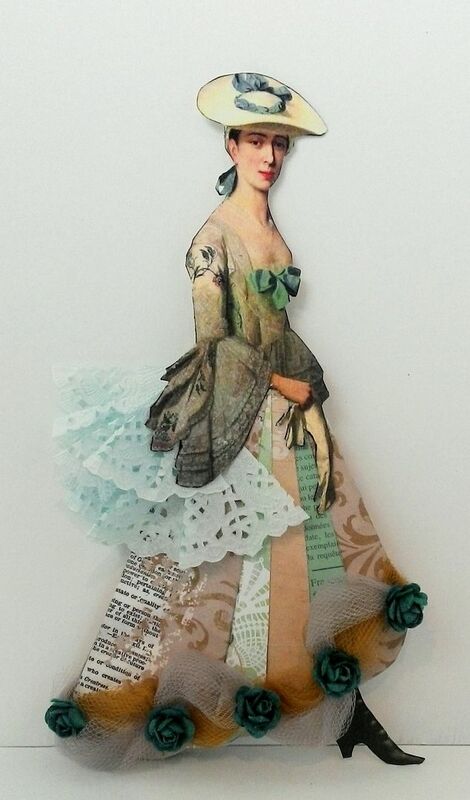 To determine the size of the paper, I used the finished size of the paper Victorian doll (which is 7” tall) plus some extra headroom (3 ½”) for the height. To determine the width of the paper I used the outside measurement of the bottom of the box (4”) plus 1 ½” for each side of the box for a total of 7”. 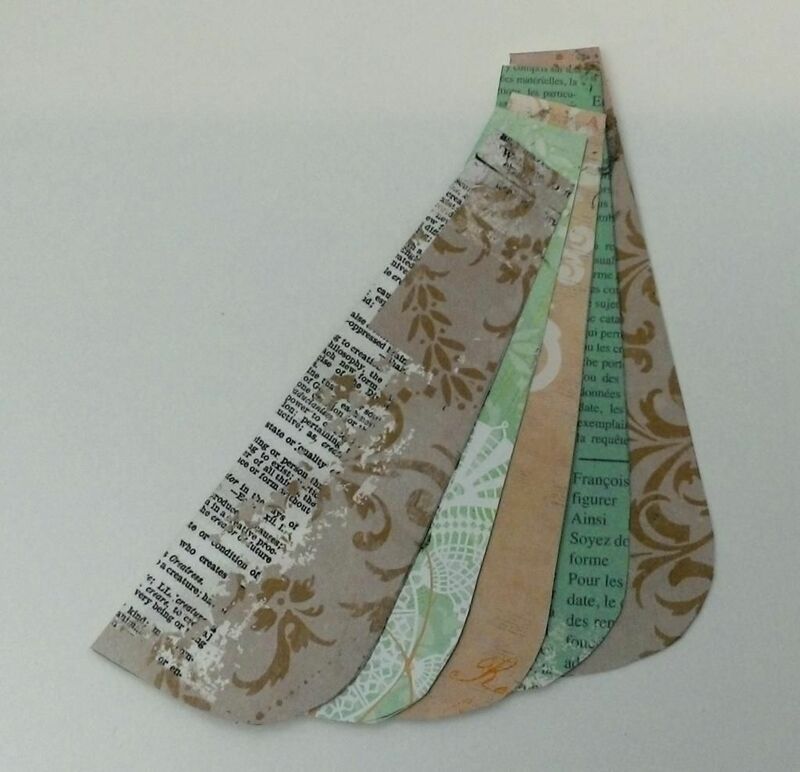 The end result was that I cut two 10 ½” x 7” pieces of decorative paper and glued them together mindful of which designs I wanted exposed on the inside and the outside. Next, I scored and folded two lines on the paper 1 ½” from the long edge of the paper. This will make it easier to glue the paper to the box. I then glued the paper to the outside bottom of the box. 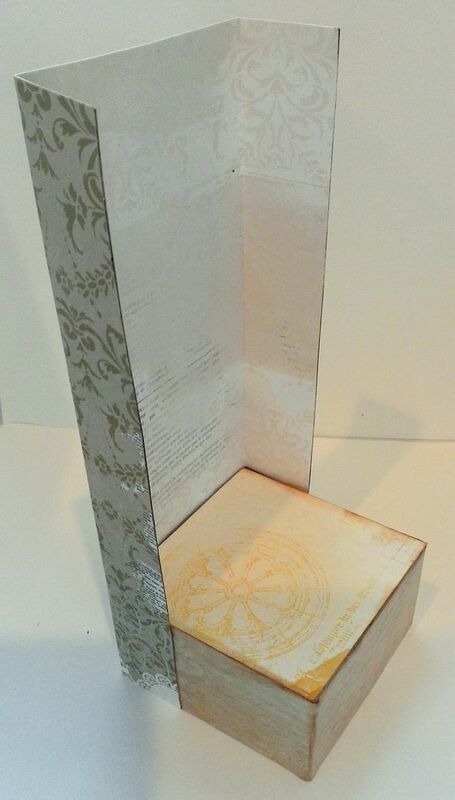 If you are going to decorate the inside of the paper you might find it easier to add your embellishments before gluing the paper to the box Note that the paper only wraps partially around the box. This will create support for the lid (which will be the top) but allows the base of the box to be exposed so that you can see the items inside. 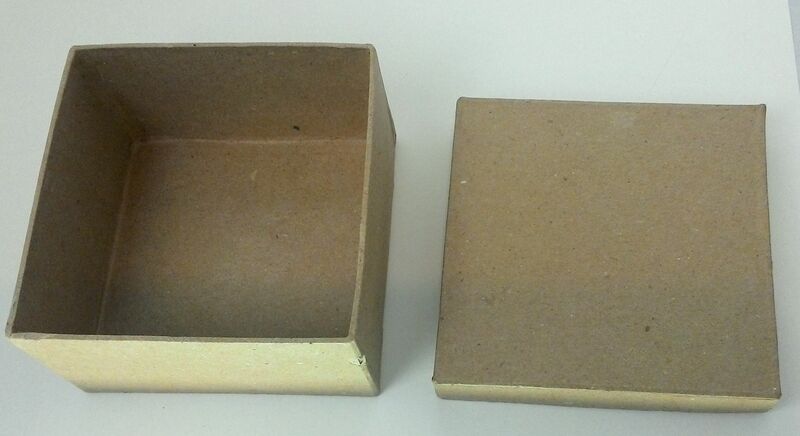 The top of the paper is then glued to the inside of the lid of the box creating the top. I also glued a wooden dowel in place at the same time as attaching the lid. 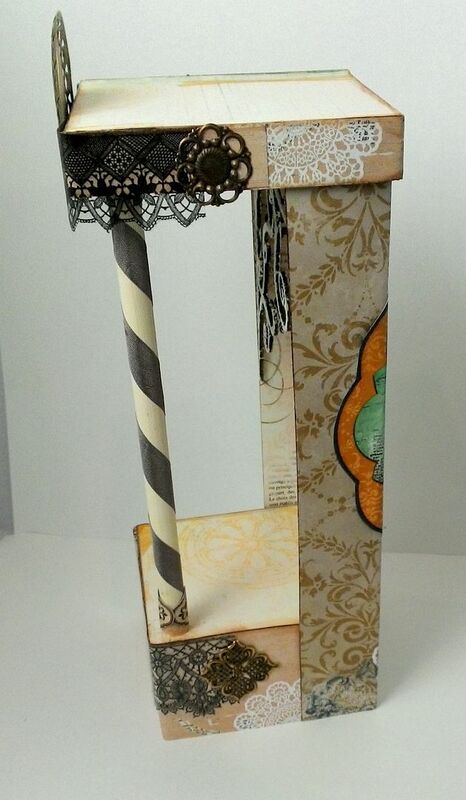 The dowel is used to create more visual interest and to add more support to the top. I painted the dowel cream color paint and wrapped it with seam binding. At the ends of the dowel I added pieces of decorative paper. To determine the length of the dowel, I measured the distance between the top of the base to the top of the paper that is attached to the base. In the case of this piece it measure 8 1/8”. In the picture below you can see the lid attached to the top of the paper (note the paper is inside the lid) and the dowel is attached to the base and to the inside of the lid. That’s it; you have a basic diorama structure! Of course, there all kinds of embellishments that you can add to the basic structure. Based on what you plan to add, you might want to attach it before or after you assemble your structure. 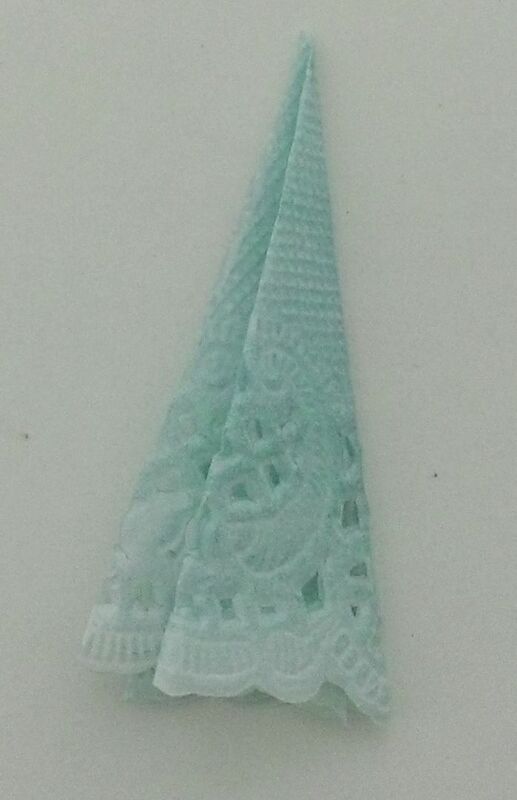 To the top and bottom I added images of lace printed on transparency sheets. I used brass pieces to finish the edges. To the top I added a clock from my Tick Tock Collage Sheet and framed it with a circular brass piece. 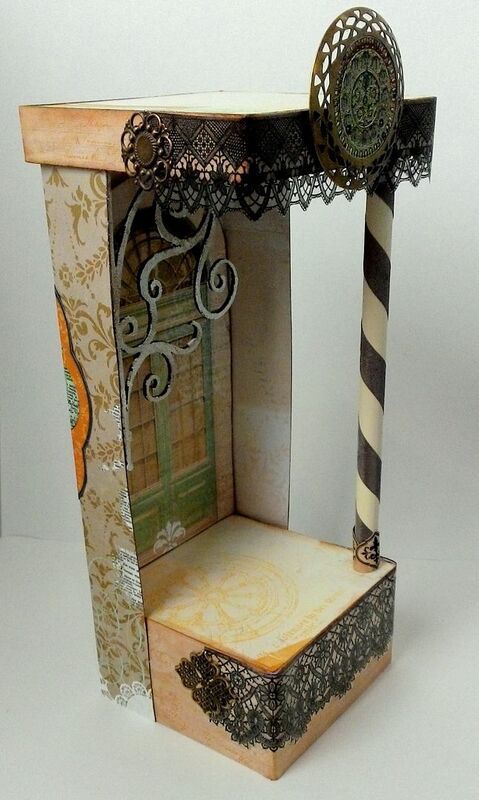 On the inside edge I added a chipboard corner scroll painted with Ranger Picket Fence Crackle Paint. 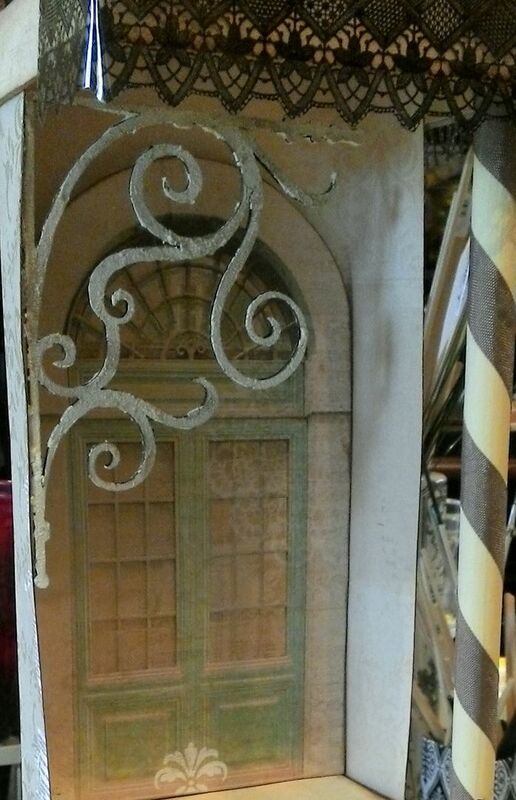 I cutout a door from one of the decorative papers and attached it to the inside, popping it out slightly with the use of double stick foam core tape. On the back I added another image from the decorative papers. Since the image I was inspired by had only the top half of a dress, I needed to create a skirt. 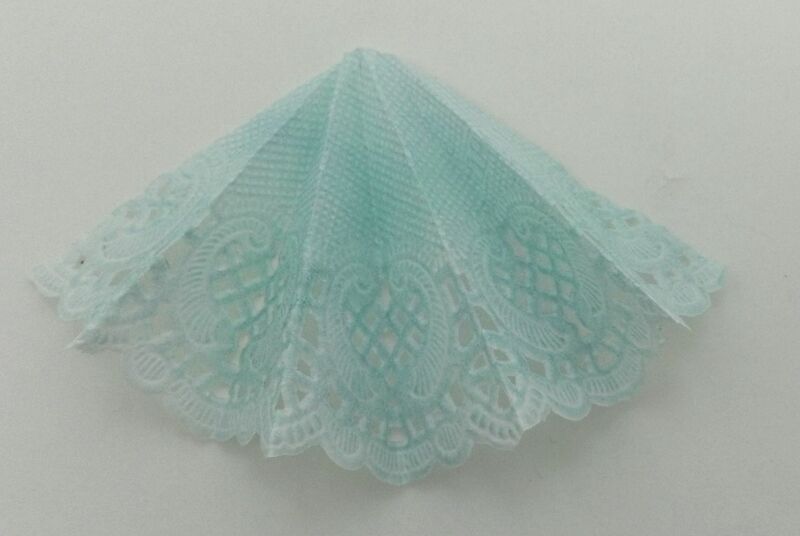 First, I set out to make a bustle from a paper doily. 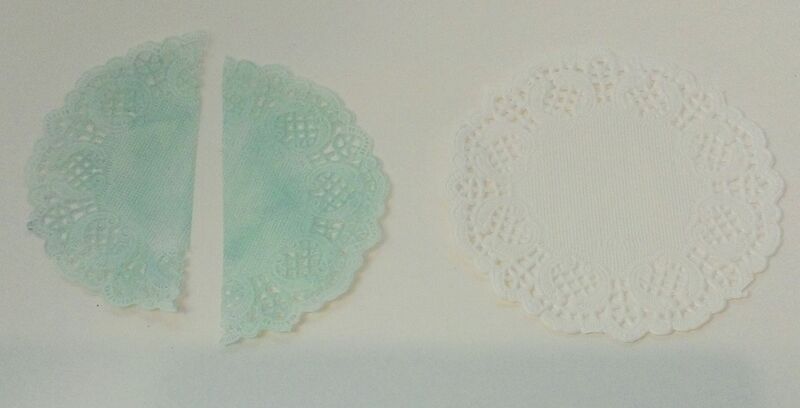 I inked both sides of the white doily with Tumbled Glass Distress Ink and cut the doily in half. Starting with 1/2 or the doily, I folded the doily in half. I folded the doily in half again. I folded the doily one last time. 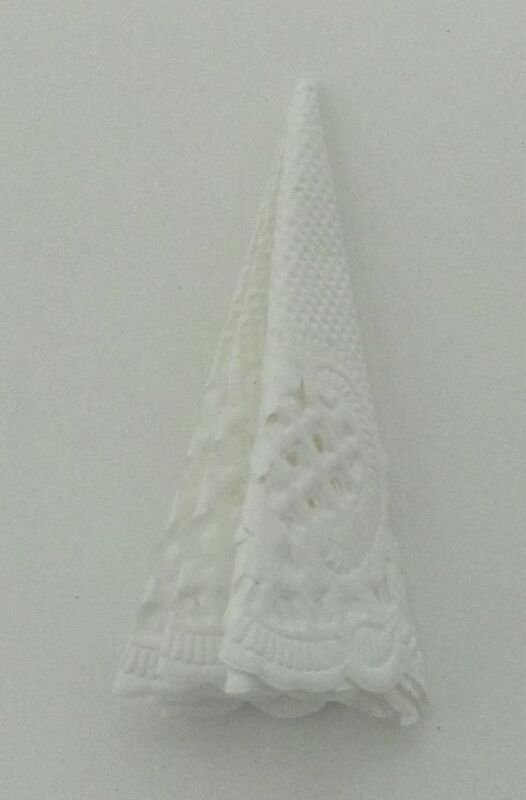 The doily is now folded three times. 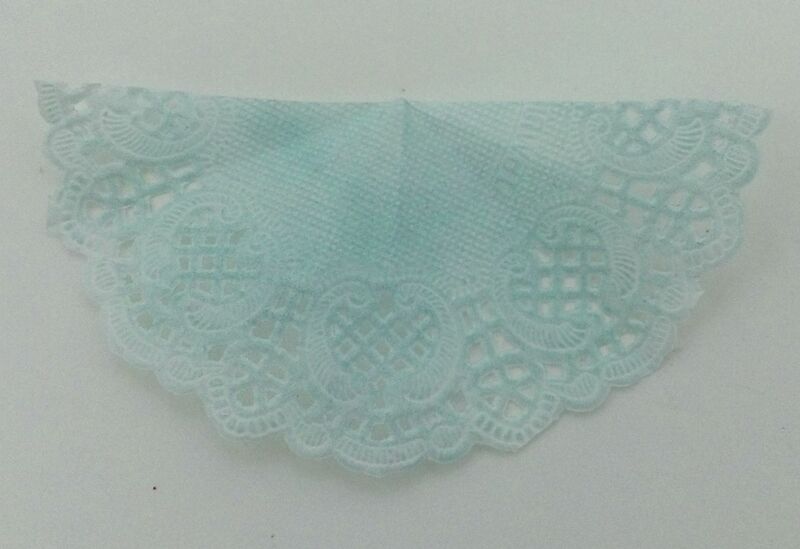 Next, I unfolded the doily. 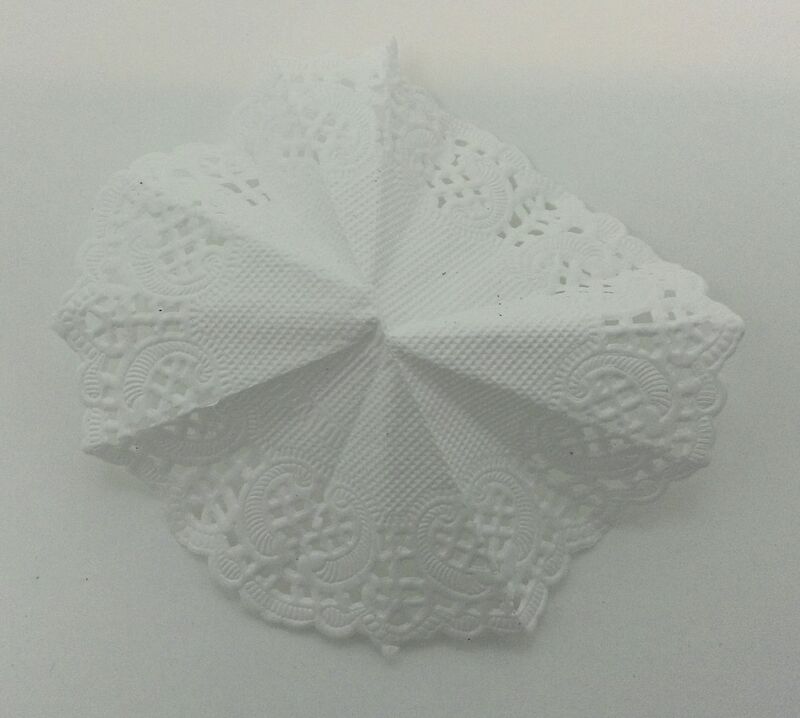 The purpose of the folding was to create fold lines to make it easier to accordion fold the doily. Folding it first created equally spaced fold lines which would have been hard to make if you tried to accordion fold the doily with no fold lines. I started accordion folding the doily starting at one end using the pre-folded lines as a guild. 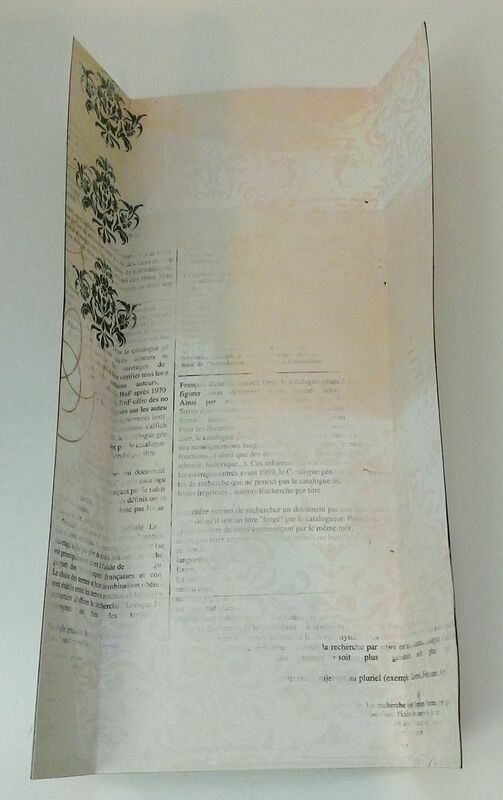 Continue accordion folding the doily along the guide ines until you reach the end. 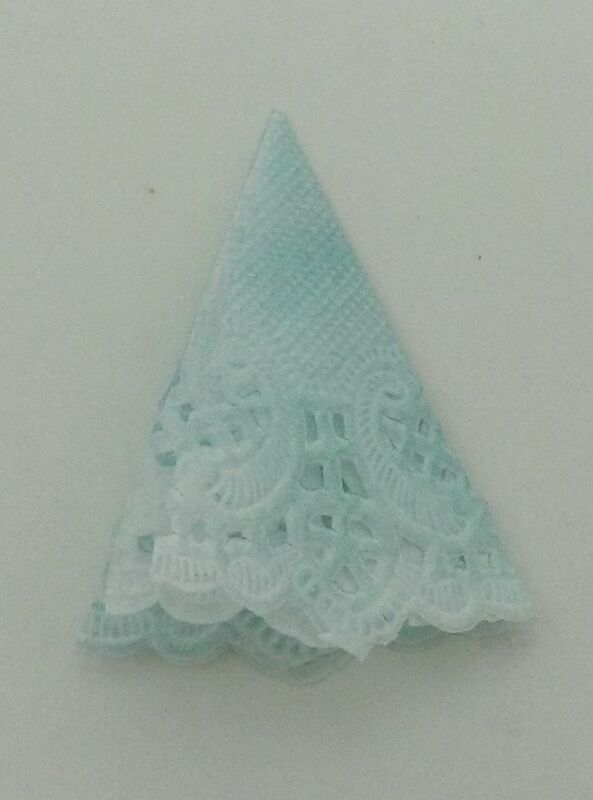 You should end up with a half doily that looks like the picture below. 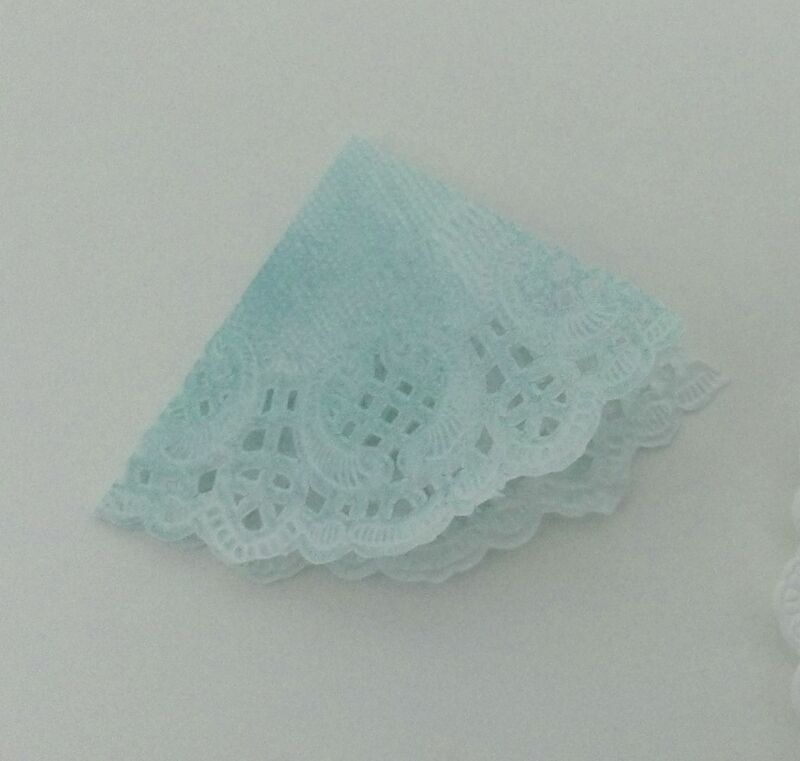 I repeated the same process for the 2nd half of the doily. Next, I made panels for the skirt. I started by creating a template made from lightweight chipboard. Below is a scan of the template I used. Feel free to download it and use it if you wish. Using the pattern, I cut 5 panels from various patterned paper and glued the panels together. In deciding on their placement I used the bottom of the bodice as my guide. 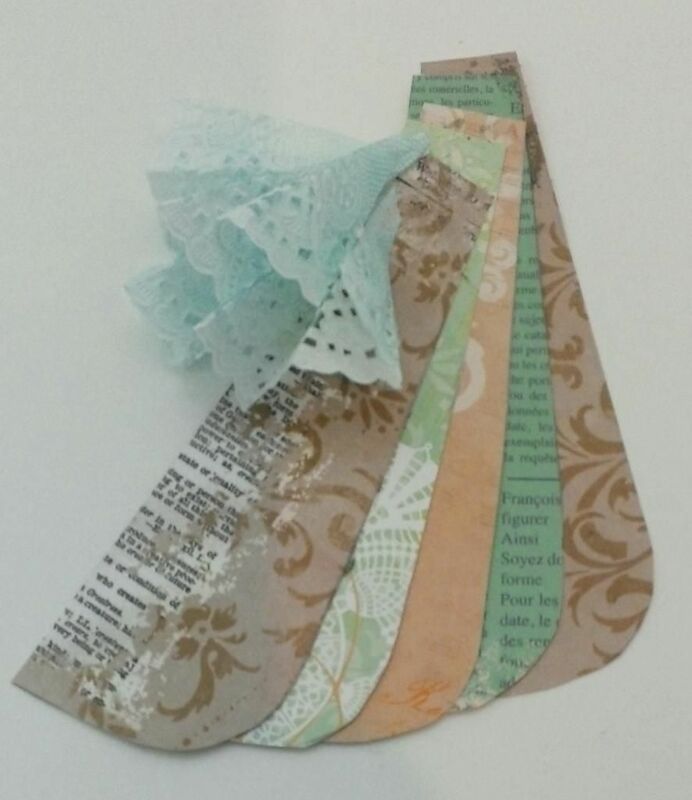 Next, I attached the paper doily bustles to the panels again using the bodice as my guide. To decorate the bottom of the skirt I used two pieces of different colored tulle netting gathered by wrapping thin wire around the tulle. I made the spaces between the gathers wider on one piece of tulle than on the other piece of tulle. The difference in spacing was because the wider spaced tulle was going to be placed on top of the other piece of tulle and I wanted it to puff out more. I attached the darker or shorter piece of tulle by gluing down each wrapped wire and then gluing the rough ends behind the skirt. Next, I glued the longer tulle piece on top of the shorter one in the same manner. I used paper roses to add more decoration and to cover the wire. In order to attach the woman to the base of the diorama, I glued flat toothpicks to the bottom of the skirt. I also glued additional paper panels to the back of the skirt to support the toothpicks and to hide the rough edges of the tulle. After playing with the doily to make the bustle I decided it would make a lovely parasol. 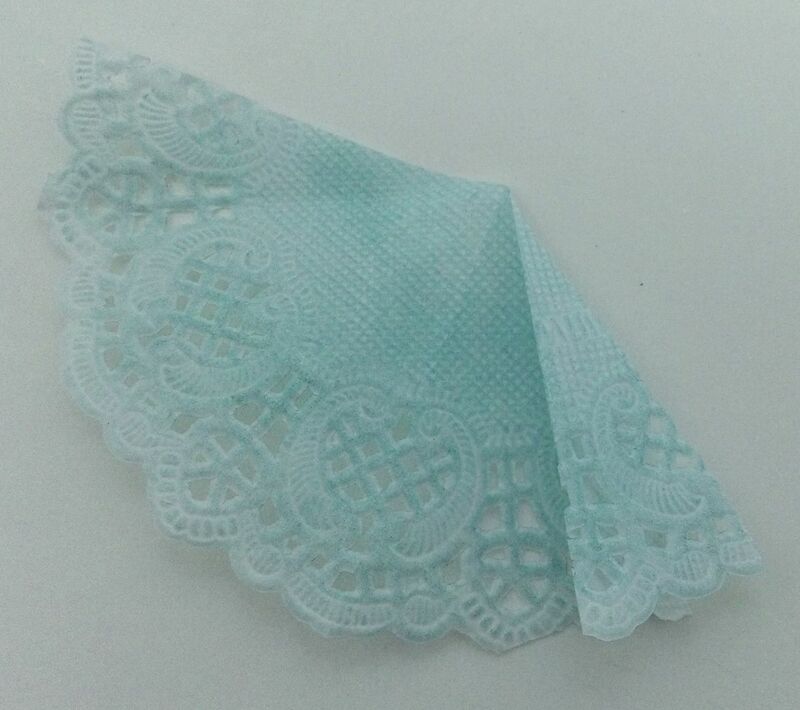 First, I folded a full doily in half, then in half again 3 times which was about as many times as you could fold it. 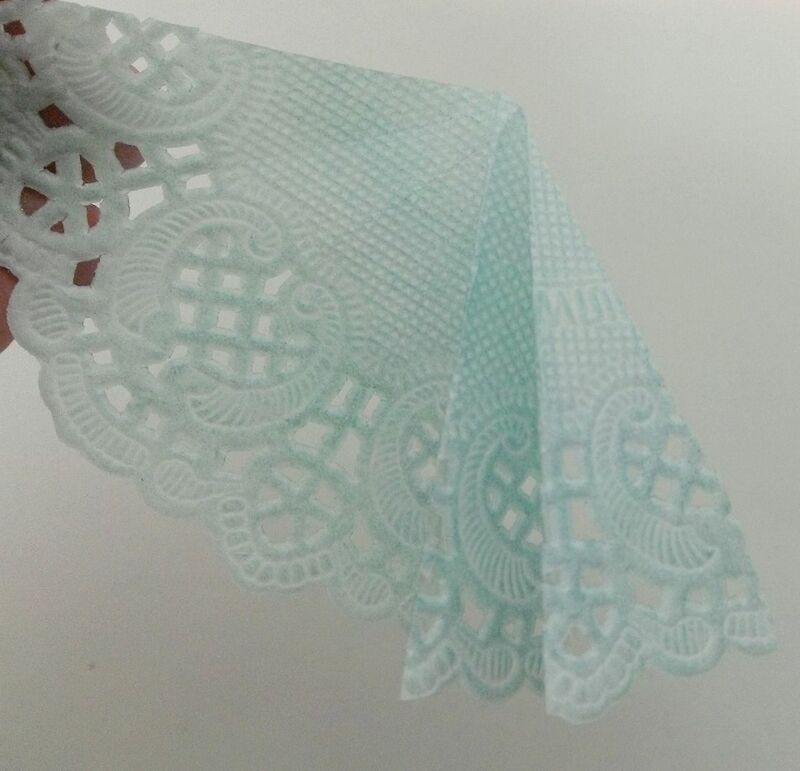 Next, I opened up the doily and used the fold lines as a guide to help me accordion fold the doily (just like with the bustle). Just pick a place to start and keep folding until you come full circle. To jazz up the parasol I used tiny ribbon bows. The handle is a wooden skewer and the end is a brass box foot that just happened to fit the skewer perfectly. 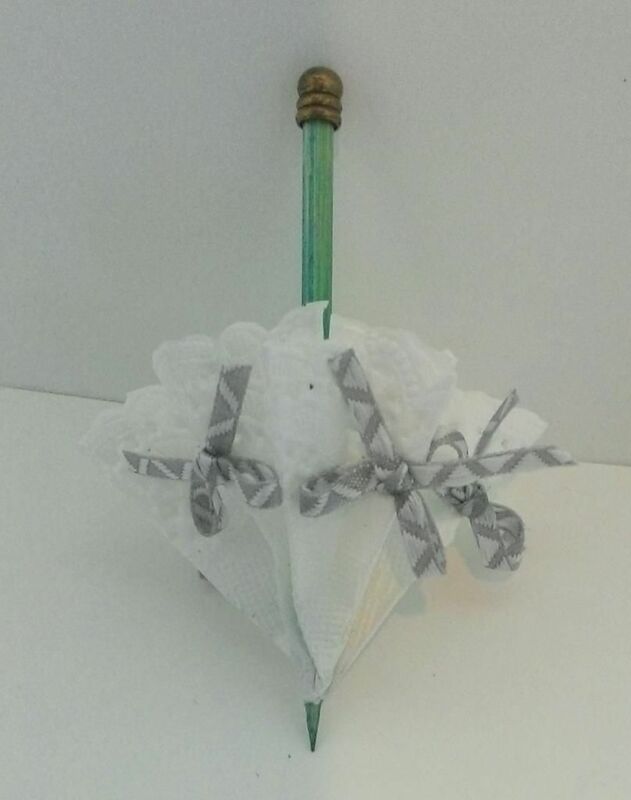 When gluing the handle to the doily I pinched the bottom of the doily to the skewer and glued it in place inside. This helped keep the parasol partially closed. Whenever I’m working on a project and I’m almost finished I invariable decide that it needs more touches here and there. In the pictures below you can see that I decided to add a chipboard foliage piece accented with a piece of brass filigree behind the clock. I also glued tulle to the top and wrapped it around the column. 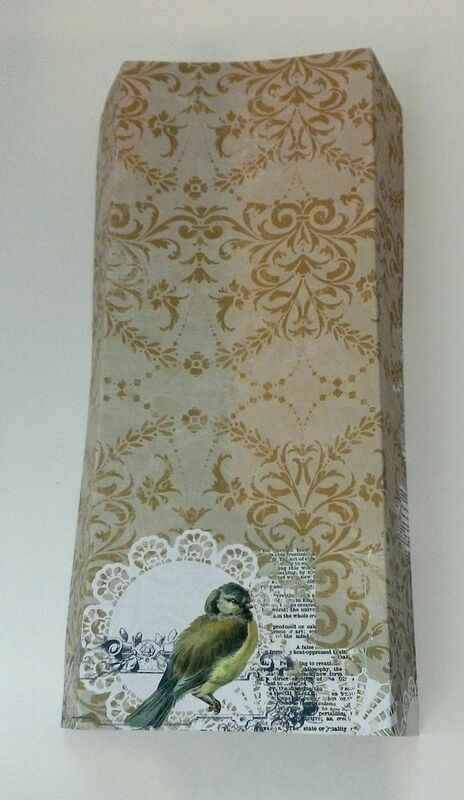 At the point of attachment I wrapped a brass leaf and bird piece around the column. Using the box lid for the top of the diorama provides a great place to hang stuff as you see with the birdcage below. At the base of the piece I added rondelles threaded with two different colors of seam binding. I also added gold metallic Dresden to the top and bottom to trim up the pieces. 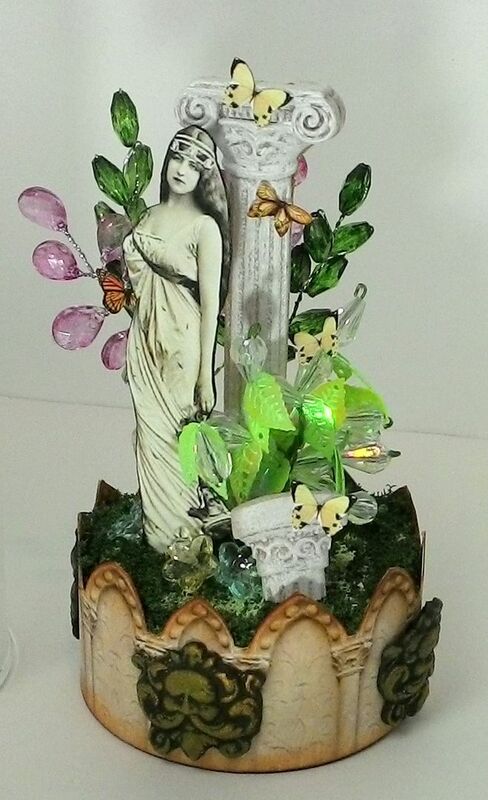 I poked holes into the bottom of the box to accommodate attaching the lovely Victorian lady. I used a very liberal amount of E6000 glue underneath the box to keep her in place. I hope I have demonstrated to you how easy it is to create the base for a diorama that can be customized for any theme and that you are ready to create one for yourself! You can find the sample in this tutorial for sale in my Etsy Shop. This is a project that has been sitting on my worktable forever waiting to be finished. The overall size of the piece is 6” tall by 2 ¾” wide. 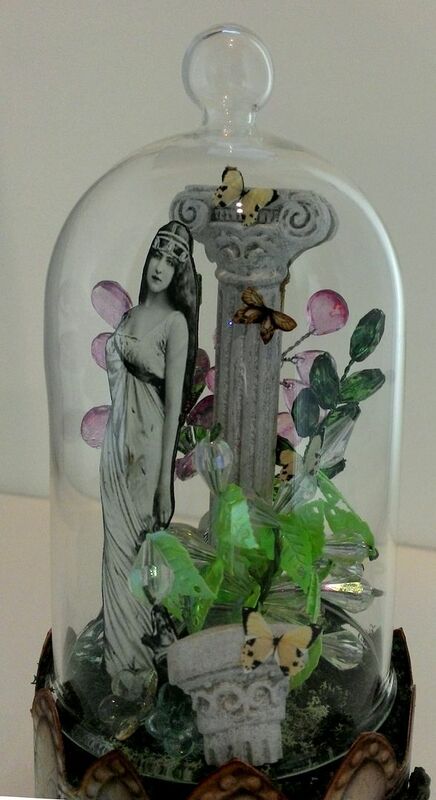 I added decorative paper to the base which also helps to keep the glass dome in place. 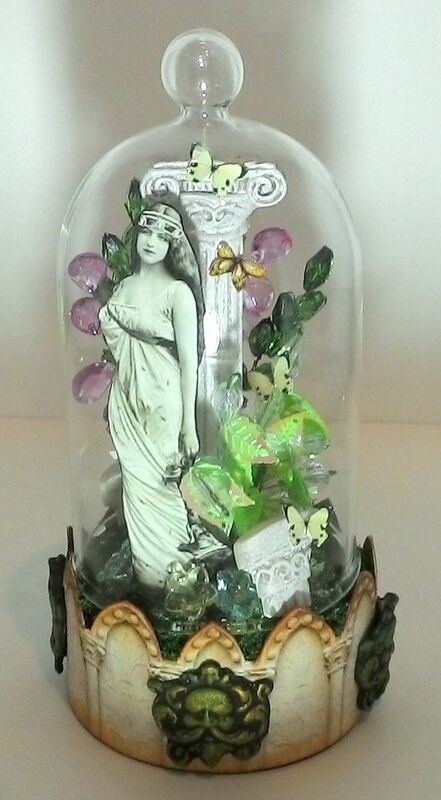 The glass dome is removable. The columns are made of resin. I broke one of the columns apart to give the scene the appearance of a crumbling temple. The acrylic sprays are colored with alcohol inks. The green moss is a product called Flower Soft. The green man plaques around the base are made of clay. I used a brass green man piece to make a mold and then used the mold to make 4 paper clay plaques. I reversed the image of the goddess so it looks the same from the back or the front of the piece. Click here for a tutorial on how to make molds. I hope you all had a great holiday season. I’m slowly getting back into the artsy crafty groove and kicking off the New Year is a wintery ATC. 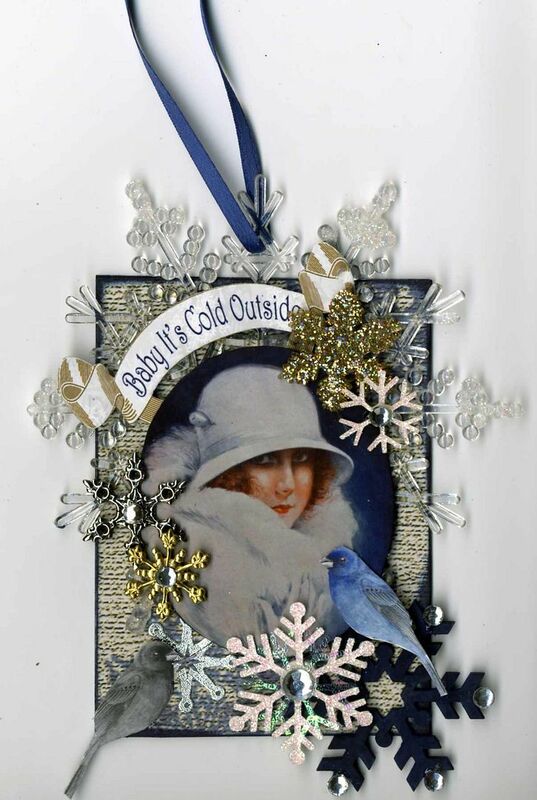 The birds and the woman at the center of this piece are from my Baby It’s Cold Outside collage sheet. 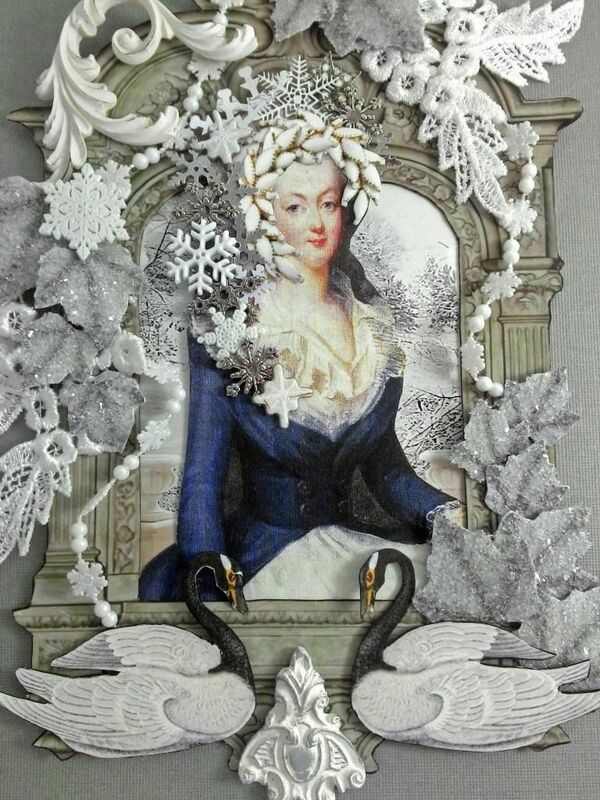 I’ve surrounded her with lots of snowflakes and mounted behind the image is a large snowflake. I have lots of new eye candy to share with you this month and some new tutorials. So onto a fabulous new year full of art fun!